Launched at Rs 2.41 lakh, the Honda CB300R ventures into an extremely competitive territory where it will lock horns with the likes of the KTM 390 Duke and the Royal Enfield Continental GT. Here’s a look at where it stands against the two. Honda Motorcycle and Scooter India (HMSI) have been rather quiet over the last few years in the affordable performance motorcycle segment. They have now CB300R to India, and it is their first launch in the sub-500cc class since they brought in the mildly updated CBR250R in March last year. Brought into India via the CKD route, the CB300R is priced at Rs 2.41 lakh (ex-showroom). 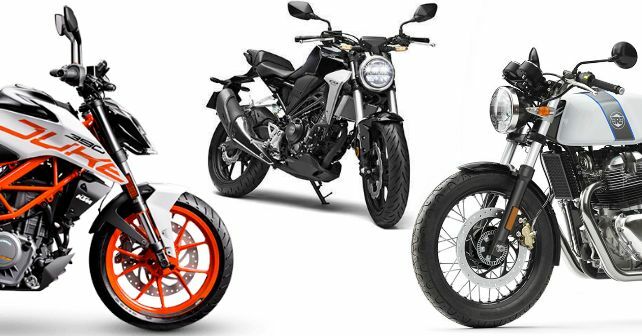 At this price, it faces some tough competition from capable machines like the Royal Enfield Continental GT 650 and the KTM 390 Duke. Let’s take a closer look at the specifications to see where the new Honda stands. All three motorcycles are quite different in nature with respect to their engines. While the Honda and KTM have single-cylinder motors, the Royal Enfield is a parallel-twin. Meanwhile, the 390 Duke has the biggest bore of the lot, which allows KTM to pull out 42.9 horses from a 373.2cc single. The Honda CB300R uses a 286cc single-cylinder liquid cooled motor that develops 30 horses and 27.4Nm. At 47bhp and 52Nm, the Royal Enfield makes the maximum power and torque among the three. All three motorcycles come paired with a six-speed transmission. The Royal Enfield is the only offering here to be fitted with telescopic forks up front – the Honda and KTM, both come with upside down forks. At the rear, the RE comes with twin-shocks with piggyback reservoirs while the other two in question come with a monoshock setup. The Continental GT 650 and the 390 Duke have been plonked with a 320mm disc at the front. The CB300R gets the smallest, 296mm disc. At 240mm, the Continental GT 650 has the largest rear disc of the three – the 390 Duke gets a marginally smaller 230mm disc while the CB300R sports the smallest, 220mm disc. The CB300R and the 390 Duke wear the same size rubber. While Honda sources the tyres from Michelin, KTM sits on Metzelers. The Royal Enfield, on the other hand, is the only motorcycle here to come with 18-inch spoke wheels. The Chennai-based firm has been fitted with Pirelli tyres. There is absolutely no surprise here really that the 390 Duke stands at the top in terms of equipment on offer – even after two years since its launch. Leading the charge is the TFT screen that offers a whole lot of information. It is light sensitive too - it switches background colours to make the infotainment easily legible. Owners can also connect their phone to this system via Bluetooth and use the buttons on the handlebar to answer calls, control music and more. The 390 Duke’s headlight comes with 6 LEDs – 2 each for Auto Headlamp On (AHO), low beam and high beam. Other features include a slipper clutch, ride-by-wire and more. The Continental GT, as well as the CB300R, don’t flaunt as many features. While the RE at least gets a slip and assist clutch, the Honda makes do with a hydraulic clutch. The Japanese offering does, however, come with an LED headlamp – something that the Conti misses out on. All three motorcycles come dual-channel with ABS. In terms of price, all three motorcycles are more or less similar. Honda has just launched the CB300R at Rs 2.41 lakh (ex-showroom). The 390 Duke carries a sticker price of Rs 2.44 lakh. While the Continental GT is the most expensive of the lot at Rs 2.65 lakh, it also gets the advantage of being the only twin cylinder offering here. And then, it also makes the most power and torque of the three in the discussion. Honda claims that the CB300R is a neo café racer and will appeal to buyers who are looking for style. The 390 Duke, on the other hand, is all about performance and great value for money. Meanwhile, at the same price as the Honda CB300R, buyers can also look at the TVS Apache RR310 and if you want something that develops identical output but at a more affordable price, there’s also the option of the Bajaj Dominar.